I have just pushed the files for the 2018.2.1 release of FlightGear to our primary host at https://sourceforge.net/projects/flightgear/files/release-2018.2/ Within the next few hours you should be able to download your copy from one of their mirrors. 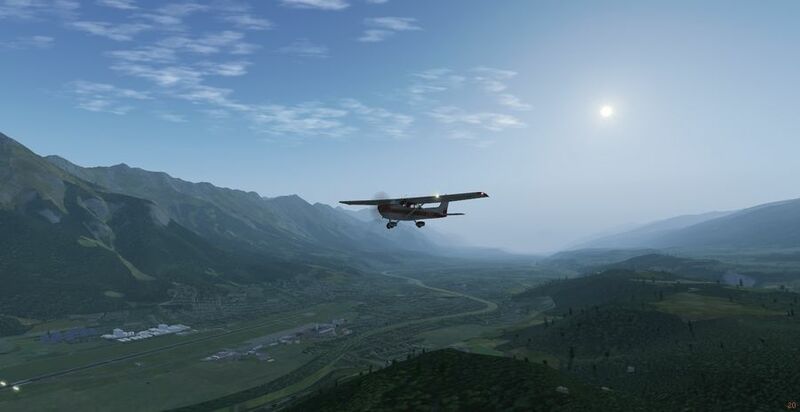 As always, the latest release can be downloaded from https://sourceforge.net/projects/flightgear/files/release-2018.2/, and the changelog is found at Changelog 2018.2. Stay tuned for the 2018.2.2 bugfix released, bringing launcher bugfixes and more! TerraMaster was updated to build 1.13 on May 24th 2018. The latest version may be obtained from https://portree-kid.github.io/terramaster/ and corrects a bug "that would affect users which DNS might not always reply correctly". Find out more at the FlightGear forums. The IDG-MD-11X received a massive update in the past few weeks, adding an improved electrical system, autobrake, and an all-new ignition system, allowing the aircraft to be started manually at last. Furthermore, using new technology from 2018.1, the engine spool rates were adjusted. The aircraft, which now requires 2018.1 or later, may be obtained from it0uchpods Hangar. The IDG-A32X and IDG-A33X also received many FCS improvements, and the improved spool system, meaning that they also require 2018.1 or later. They also may be obtained from it0uchpods Hangar. D-ECHO has started work on the SR22T with JSBSim FDM, the development version (WIP) can be found here. Shared 3D models have been recently submitted and included in Terrasync for the following Italian airfields: LIDK, LIPA, LIPD, LIPI, LIPQ, LIPS and LIPV. In May some great contributions to AI traffic have been pushed to Git. Ian (BecOzlcan) created some detailed AI liveries and traffic files for two new airlines "Air Vanuatu" and "Windrose Airlines" (traffic by SP-KOK). User Swamp has proposed a VFR flight in June to help relieve tension and stress in the community. Find out more at the forums! Thanks for reading FlightGear Newsletter May 2018! ↑ Torsten Dreyer (May 22, 2018). FlightGear 2018.2.1 released!. This page was last modified on 3 June 2018, at 09:34.